Blackwood is the swamp area on the southernmost part of Cyrodiil. 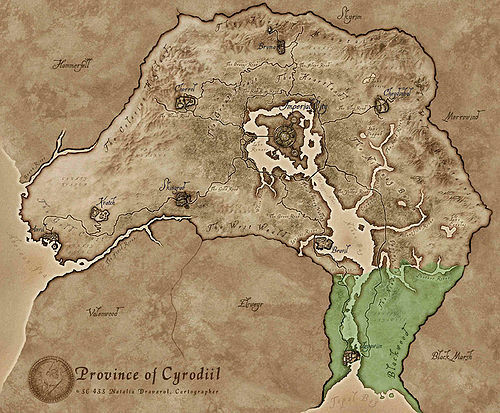 The borders of Black Marsh lie to the east, the borders of Elsweyr lie to the west and Topal Bay lies to the South. The regions of Nibenay Basin and Nibenay Valley border on the north. Traveling to and from the Blackwood area is done via the Yellow Road going from Leyawiin to the eastern part of the Imperial City. The Green Road also goes through Blackwood, from Bravil to Leyawiin. By and large, the vegetation of the region matches its dank nature. The most prominent plants are Green Stain and Clouded Funnel mushrooms, and Bog Beacon and Stinkhorn mushrooms are unique to the area. There are also quite a few Somnalius plants and Lilies, while Nirnroot finds a natural home along the banks of the Niben and in the dark pools to the east. A list of places found in the region of Blackwood, Cyrodiil. Green Road — Main road from the Imperial City to Bravil and ultimately to Leyawiin. Yellow Road — Eastern road from the Imperial City to Leyawiin. Topal Bay — The large body of water to the south of Leyawiin and Blackwood. A list of all quests involving the region of Blackwood.